Richard Cope, an Englishman, designed and built his first press in 1820. It is said that Cope may have worked with George Clymer, the inventor of the Columbian press. But, research is sketchy and most of what has been written is hearsay. There are plenty of reasons to believe that both Clymer and Cope knew each other well. In fact, both were located in London’s Finsbury area and were engaged in machine construction at similar times (Clymer in 1817 and Cope in 1820). That’s where the similarities end. 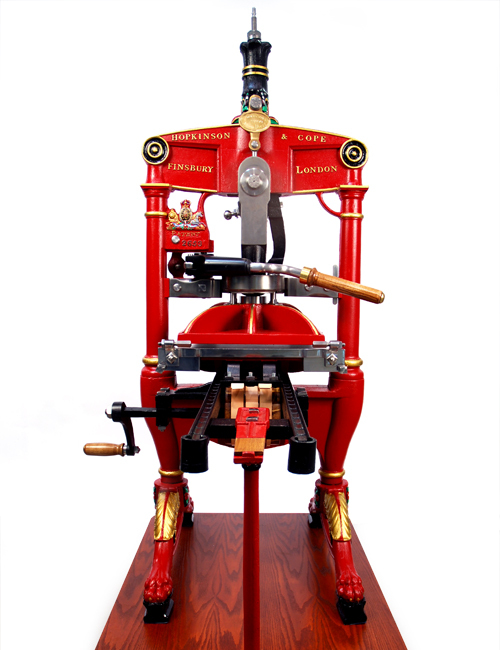 The Columbian, using a unique leverage system that eliminated the classic wine screw, was embellished with all sorts of flamboyant artistry and, of course, high on top sat the American Eagle. Cope designed a toggle and lever with links as his first attempt. Our museum has such an example with the Belgian made J.P. Lejeune. Links proved troublesome by breaking. It was Cope’s workplace foreman and eventual owner, Mr. John Hopkinson, who removed the links and “improved” the Albion to a point where it went on to become the favoured press in Great Britain. The Albion was a completely different machine to the Columbian. The platen was returned by a compression spring which was very successful. There was a way to adjust the platen’s height quickly as compared to the Columbian. Finally, the Albion was English and pride of one’s country played a role in what the printing industry preferred. 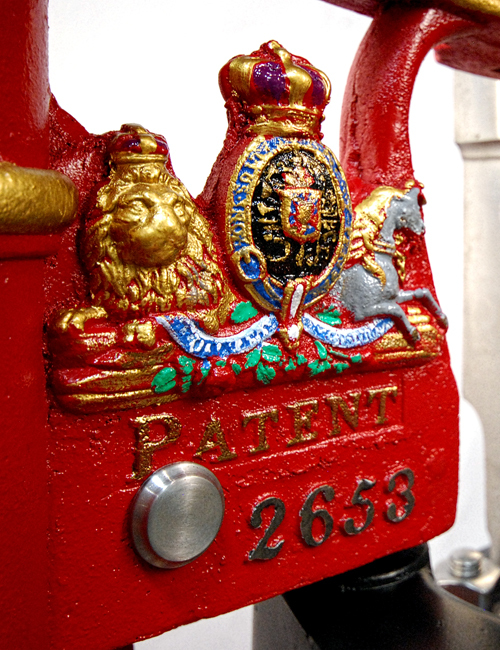 Many Albions had a the royal coats of arms cast into the frame along with the word PATENT. But, neither was the machine accredited by royalty or held in registry. Our machine dated 1848, was made in Finsbury, London by Hopkinson. 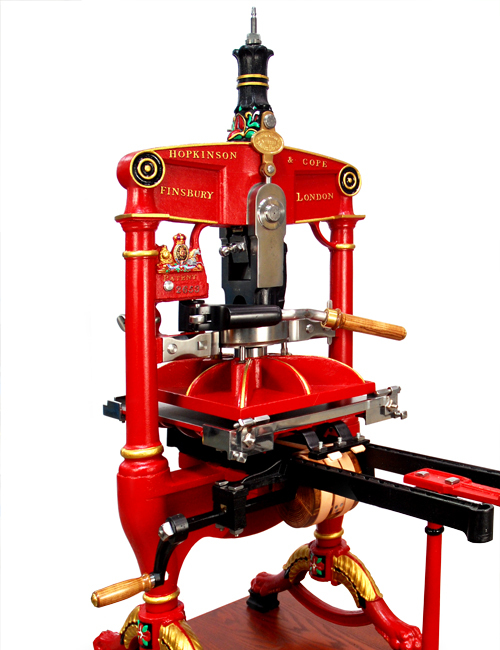 It carries all the improvements Hopkinson made and has the Hopkinson & Cope name on its face. After Cope’s death in 1828, his estate was taken over by Mr. Jonathan and Jeremiah Barrett. From 1830 till 1847, both Cope and the Barrett’s names were on the press. 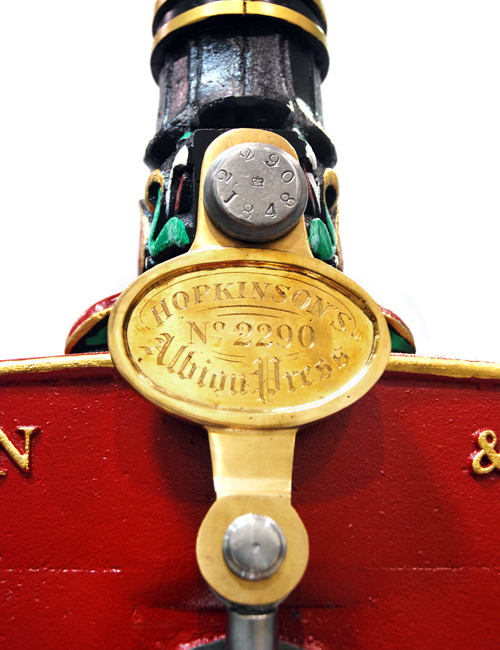 In 1839, Hopkinson produced his 100th “Improved Albion”. Hopkinson died in 1864 handing the business back to Cope’s son, James Cope. Several variants of the Albion were made. Cope, prior to his death, removed the compression spring in favour of a counterweight to return the platen. Perhaps, this was a reaction to Clymer’s Eagle counterweight? But, this was short-lived, and the Albion returned to the spring. Later in the late 1850's or early 1860’s, Hopkinson-Cope also built a copy of the Columbian. We have such an example of this press in our Collection. The Albion is a legendary machine - more for its clever function, ability, and design than its beauty.